Update 1/6: HDMI Forum has notified us that the HDMI 2.1 uses DSC 1.2 compression for everything higher than 8K with 4:2:0 chroma sub sampling. The story was updated accordingly. The most important feature that the HDMI 2.1 specification brings is massively increased bandwidth over predecessors. That additional bandwidth (48 Gbps over 18 Gbps, a bit more than what a USB-C cable is rated for) will enable longer-term evolution of displays and TVs, but will require the industry to adopt the new 48G cable, which will keep using the existing connectors (Type A, C and D) and will retain backwards compatibility with existing equipment. The standard-length 48G cables (up to two meters) will use copper wires, but it remains to be seen what happens to long cables. 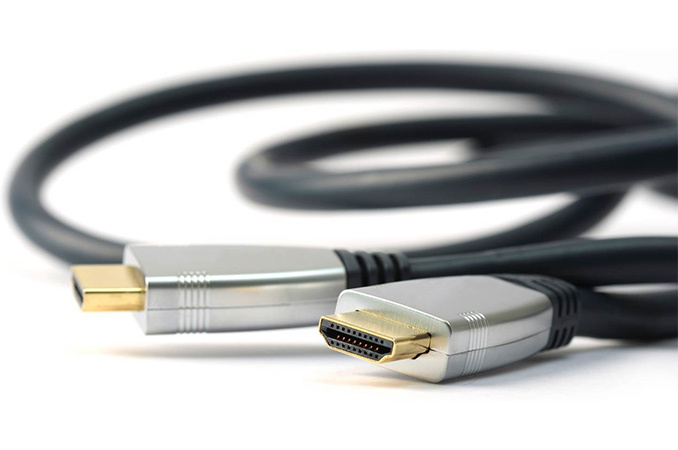 It is noteworthy that while some of the new features that the HDMI 2.1 spec brings to the table require the new cable, others do not. As a result, some of the new features might be supported on some devices, whereas others might be not. The increased bandwidth of HDMI 2.1’s 48G cables will enable support of new UHD resolutions, including 4Kp120, 8Kp100/120, 10Kp100/120, and increased refresh rates. It is no less important that increased bandwidth will enable support of the latest and upcoming color spaces, such as BT.2020 (Rec. 2020) with 10, 12, or even more advanced with 16 bits per color component and without compression. HDMI Forum does not say it explicitly, but the version 2.1 of their standard will also likely support the BT.2100 (Rec. 2100), which has a number of important enhancements to the BT.2020 when it comes to HDR. While HDMI 2.0 already supports BT.2020 and HDMI 2.0b adds support for HDR10 (through support for Hybrid Log-Gamma (HLG)), it only can transmit 10 and 12 bits per sample at 4Kp60 resolution. To support HDR at 8K, one will need HDMI 2.1. Moreover, the new HDMI 2.1 standard brings support for dynamic HDR metadata, enabling content makers to control levels of color, contrast and brightness on a frame-by-frame basis. The important part here is that dynamic HDR will not require the new 48G cable to handle video in up to 4Kp60 resolution and thus manufacturers may add support for dynamic HDR even using a firmware update. That is not going to work for a lot of existing equipment because display pipelines work differently and many TVs are incapable of anything beyond HDR10. Moreover, recorded media (i.e., Ultra HD Blu-ray) does not currently support dynamic HDR (and when the next-gen standard emerges, it will bring a lot of other features, including a new content protection algorithm), which means that two primary sources for dynamic HDR content will be games and streaming media (which is an interesting thing, given the focus of AMD’s recently announced FreeSync 2 technology). It is also noteworthy that HDMI Forum does not currently mention particular HDR implementations, but only says that the HDMI 2.1 standard will support a variety of them. In fact, dynamic HDR will not be the only feature of the HDMI 2.1 specifications applicable to games. Among other things, the new standard will support the game mode variable refresh rate (GM VRR). Nowadays, AMD already supports FreeSync-over-HDMI using a custom mode and with the HDMI 2.1 everything gets a little easier. The HDMI 2.1 GM VRR will work for 4Kp120 and 8Kp60 resolutions with the new 48G cable, but for lower resolutions/refresh rates, the HDMI 1.4 cable will be enough. We do not known whether current-gen sources (i.e., GPUs and consoles) could be updated to support the HDMI 2.1 GM VRR, but the upcoming graphics processors are going to support the tech simply because they are going to support the HDMI 2.1 in general. When it comes to sinks (i.e., TVs, displays), it is unclear whether this is a full-on requirement - if all sinks will need to support VRR - but it is likely that they will support it in their next generations as well. Meanwhile, support of GM VRR by HDMI 2.1 also means that variable refresh rates may be coming to next-generation consoles (whenever they come out), finally making the feature a default one for gaming. The final capability of the HDMI 2.1 specification is the eARC — support for object-based many-channel audio formats. The HDMI Forum did not mention specific brands, but Dolby Atmos and DTS:X seem to be the most likely candidates to support. The HDMI 2.1 specification brings a number of long-awaited features to the table, some of which may show up in shipping products sooner, the other will become available years from now. HDMI Forum plans to publish the final standard in Q2 2017 and release the HDMI 2.1 compliance test specification in Q2 or even Q3 2017. That said, do not expect any features of the new spec to become available earlier than in the second half of this year (2018 seems more likely). Meanwhile, from licensing standpoint, any company with a license for the HDMI 2.0 spec can have access to the HDMI 2.1 blueprints. "48G cables enable up to 48Gbps bandwidth for uncompressed HDMI 2.1 feature support including 8K video with HDR." Virtually all 4K and 8K video content that is available or WILL BE available is chroma 4:2:0, so the compression they are referring to is likely TRANSPORT COMPRESSION - which is what DisplayPort uses. I think the article is somewhat confusingly written, but isn't claiming HDMI 2.1 supports 8k120 at full color rate. Other sources claim 8k60 and 4k120, which makes more sense. No, it's not. Not for general purpose compression of images. For example random noise (if you remember analog TV noise) is incompressible. Nvidia does "up to" 8:1 compression - meaning some parts of the image are compressed 8:1.